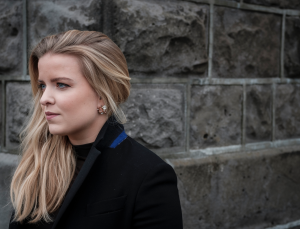 Áslaug Arna Sigurbjörnsdóttir er þingmaður Reyjavíkur fyrir Sjálfstæðisflokkinn, ritari flokksins og formaður utanríkismálanefndar. Fædd í Reykjavík 30. nóvember 1990. Foreldrar: Sigurbjörn Magnússon (fæddur 31. júlí 1959) hæstaréttarlögmaður og Kristín Steinarsdóttir (fædd 1. maí 1959, dáin 12. nóvember 2012) kennari. Stúdentspróf VÍ 2010. BA-próf í lögfræði frá HÍ 2015. MA-próf í lögfræði frá HÍ 2017. Starfsmaður jafningjafræðslu Hins hússins 2010. Blaðamaður á Morgunblaðinu 2011–2013. Lögreglumaður hjá lögreglunni á Suðurlandi 2014–2015. Varaformaður Æskulýðsráðs 2014–2016. Laganemi á lögmannsstofunni Juris 2016. Í stjórn SUS, Sambands ungra Sjálfstæðismanna, frá 2011. Formaður Heimdallar, félags ungra Sjálfstæðismanna í Reykjavík, 2011–2013. Funda- og menningarmálastjóri Orators, félag laganema við HÍ, 2015–2016. Ritari Sjálfstæðisflokksins síðan 2015. Alþingismaður Reykjavíkurkjördæmis norður síðan 2016 (Sjálfstæðisflokkur). Íslandsdeild Alþjóðaþingmannasambandsins 2017 – (formaður). Allsherjar- og menntamálanefnd 2017 (formaður). Member of Althingi for the Reykjavík North Constituency since 2016 for the Independence Party, Secretary of the Independence Party and deputy Chairman of the parliamentary group. Chairman of the Foreign Affairs Committee since 2017. Member of the Icelandic delegation to the Inter-Parliamentary Union (IPU) 2018 (Chairman). Member of the Judicial Affairs and Education Committee 2017 (Chairman 2017). Member of the Icelandic delegation to the NATO Parliamentary Assembly 2017 (Chairman 2017). Member of the Icelandic delegation to the Inter-Parliamentary Union (IPU) 2017.